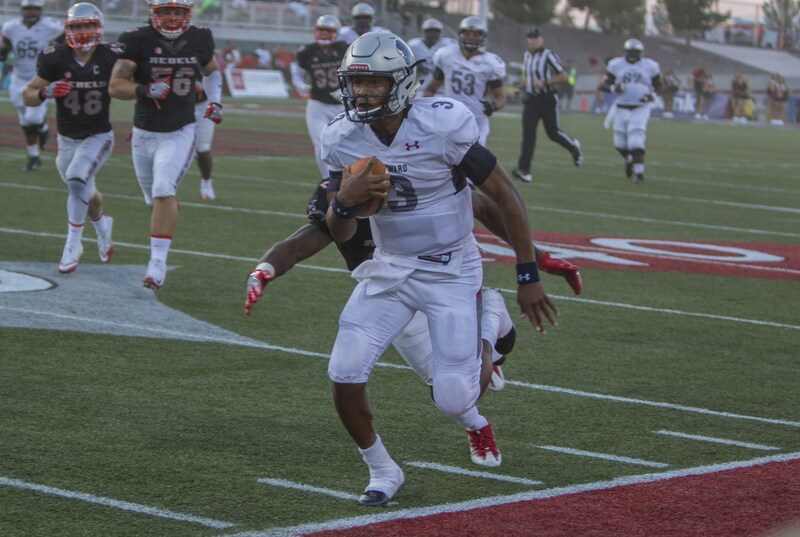 Freshman quarterback Caylin Newton led the Howard Bison in an upset victory over UNLV. 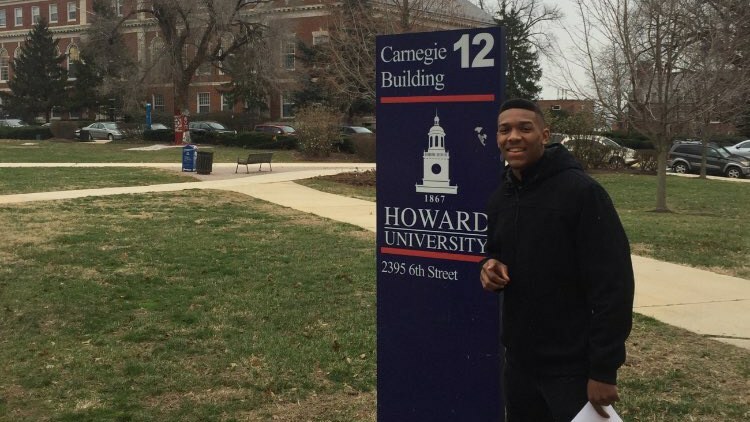 Caylin Newton, Howard University’s freshman quarterback, is trying to prove that he will be the one to lead the Mecca’s way back on the map. Newton helped to start the journey during the season opener when he led the Bison to a 43-40 victory against the University of Northern Las Vegas. Howard stormed the field at Sam Boyd Stadium in Las Vegas to celebrate one of the biggest upsets in college football history. Howard University hasn’t been known as a football school. In recent years, the football team has struggled to find wins on the field and support in the stands. But all of that may be changing now that the Bison have beaten a Football Bowl Subdivision (FBS) team for the first time in Howard’s history. And today, Newton led the Bison to a 26-24 victory over Bethune-Cookman University, throwing a touchdown and running in two more. It’s the first time since 1996 that the Bison have won at home against the Wildcats from Florida, breaking a six-game losing streak over two decades in their series. In his first game as a Howard Bison, Newton rushed for 190 yards and two touchdowns while throwing for 140 yards and adding one touchdown through the air against UNLV. After only one game, Newton established himself as the best Howard quarterback since Greg McGhee. After the victory over UNLV, the Mid-Eastern Athletic Conference named Newton Rookie and Co-Offensive Player of the Week while naming Wright the Co-Offensive Lineman of the Week. “I had confidence in Caylin as a freshman quarterback, because he earned it the old-fashioned way,” said new head coach Mike London. Brother of famed Carolina star, Cam Newton, the freshman quarterback looks to establish a name for himself on the gridiron much like he did in Atlanta. While attending Grady High School, he threw for more than 3,322 yards, accomplished 33 touchdowns, and rushed for 1,036 yards and 13 touchdowns. At 5 feet 11 and 195 pounds, Newton beat out three other competitors in a fierce quarterback competition for the starting quarterback job at Howard after joining the team last spring — before freshman would normally report to school. The Bison were predicted to finish second to last in the conference after Savannah State. Howard will be looking to far exceed this prediction and finish with a winning season for the first time since 2012. “All things are possible,” London said despite the team’s history and 2-2 record so far this year. As a leader of the football team, Newton agrees. Nicole Hutchinson caught up with him to find out how he plans to continue embodying the team motto: Mission Possible. Q: Howard University’s football team has not won a season opener since 2010, so beating UNLV was huge. How does it feel for you as a starting freshman quarterback? A: It felt great. Right after the game, it felt like we got the job done. And that’s all that mattered. A: It feels good. My whole life I’ve been called “Cam’s little brother” or “Little Cam,” and at a certain time in my life, I found out that it’s my time now. I was OK with it at first, but then when I started in rec ball and high school, I realized that I didn’t want to be called that anymore. Q: According to the media, you shared that “Howard is not a football program, yet but it will be.” What does that mean to you? Q: You guys were given a prediction of a 1.2 percent win against UNLV. How was it overcoming the odds? A: It was awesome. My body didn’t feel too good, but my soul did so that’s all that mattered. Q: Having three touchdowns is not the everyday freshman play. So how was the atmosphere, the crowd, the team, pretty much everything that night? A: Well I thought about what my Coach Marion, my OC told me. He said, “You don’t have time to be a freshman.” That’s what he told me back in the spring. Ever since that day, I just told myself that nobody is going to feel sorry for me, so I had to step up. I couldn’t step on the field if I didn’t think we were going to win or if I didn’t believe. Q: Aside from football, many people want to get to know you personally. What is one of your favorite pre-game songs? A: Ah, Cell. It’s not hip-hop, but it’s a band. It gets me going. Q: What is your favorite locker room moment? A: There’s been so many, but like they say in Vegas, what happens in Vegas, stays in Vegas. Nicole Hutchinson is a sports reporter for The Hilltop at Howard University, where this Q&A first appeared. Additional reporting by Lawrence Dow, sports editor at The Hilltop. Also see, “The Londons Come to Howard” by Tevin Eurie to learn more about the father-son duo on the Bison’s football coaching team.